Nearly half a century ago the Mariner 9 spacecraft returned images of some of the largest channels in the Solar System. Orbital observations of the gigantic channels suggested they were formed approximately 3.4 billion years ago by cataclysmic floods, much larger than any known to have occurred on Earth. The prospect that abundant flowing water once sculptured the Martian landscape ignited renewed interest in the possibility that life may have once thrived on the planet. To test the Martian mega-flood hypothesis, NASA deployed its first Martian rover; the Sojourner, on board the 1997 Mars Pathfinder spacecraft that journeyed to the red planet. NASA spent a total of $280 million on the mission, including the launch vehicle and mission operations. The terrain within the rover’s visual range includes potential fluvial features suggestive of regionally extensive flooding. However, those features suggest floods that were at least 10 times shallower than those estimated using images obtained from orbit. Hence, the mission was not able to exclude still disputed alternative views sustaining that debris or lavas flows could have in fact dominated the channels’ formational history without significant water discharges. “Our paper shows a basin, with roughly the surface area of California, that separates most of the gigantic Martian channels from the Pathfinder landing site. Debris or lava flows would have filled the basin before reaching the Pathfinder landing site. The very existence of the basin requires cataclysmic floods as the channels’ primary formational mechanism” said Rodriguez. “The basin is covered by sedimentary deposits with a distribution that precisely matches the inferred extent of inundation from potential catastrophic floods, which would have formed an inland sea,” Rodriguez said. 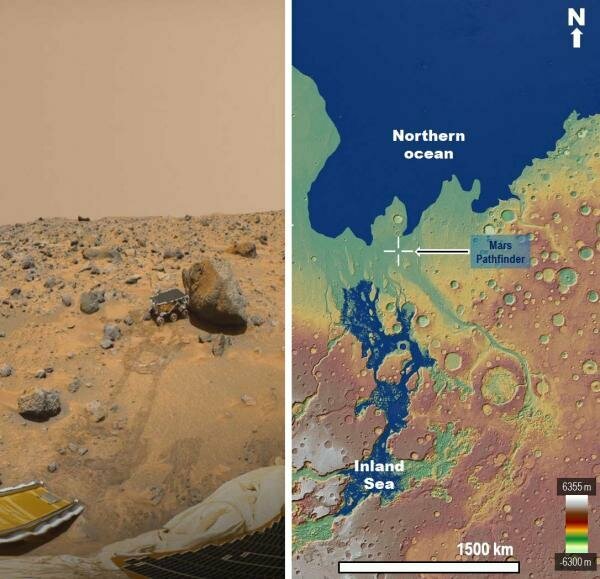 “This sea is approximately 250 kilometers upstream from the Pathfinder landing site, an observation that reframes its paleo-geographic setting as part of a marine spillway, which formed a land barrier separating the inland sea and a northern ocean. “Our simulation shows that the presence of the sea would have attenuated cataclysmic floods, leading to shallow spillovers that reached the Pathfinder landing site and produced the bedforms detected by the spacecraft,” Rodriguez said. The sea bears an uncanny resemblance to the Aral Sea on Earth in that in both instances they lack distinct shoreline terraces. Its rapid regression over shallow submerged slopes resulted in rates of shoreline front retreat too fast for the terraces to form. The same process could partly account for the long-recognized lack of northern plains shorelines. “Our numerical simulations indicate that the sea rapidly became ice-covered and disappeared within a few thousand years due to its rapid evaporation and sublimation. During this time, however, it remained liquid below its ice cover,” said PSI Senior Scientist Bryan Travis, a co-author in the paper. “Unlike on Earth, this sea was likely groundwater fed. If the ancient source aquifers hosted life, the proposed marine sedimentary materials at the Pathfinder landing site might contain a record of that life, a location easily accessible by future missions,” Rodriguez said. “An exciting observation is that the inland sea and the previously proposed northern plains ocean share a maximum paleo-shoreline elevation, implying a subsurface connection, perhaps through conduits, between the two marine bodies soon after they formed. This elevation match forms a new powerful observation that strongly favors the northern ocean hypothesis,” said PSI Senior Scientist Dan Berman, a co-author in the paper.